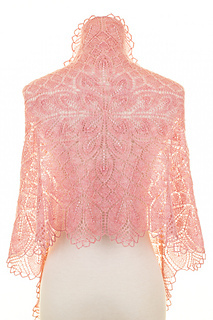 Amillë is a beaded rectangular shawl I originally designed and knit for the mothers in my wedding. You can read more of this design’s backstory and how it led to Haruni here. 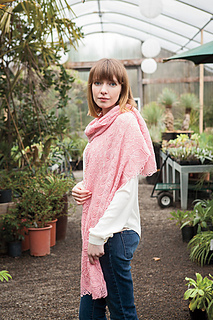 When browsing the finished projects please bear in mind that there was an ongoing KAL with a provisional version of this pattern, which was a different size. 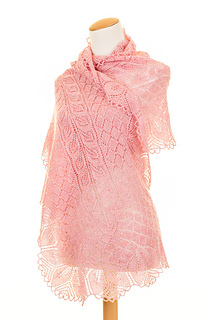 Amillë is a rectangular shawl featuring unique construction. It begins at the center back, with a circular cast on. After the first chart two of the sides are elongated, creating the central strip of leaves. Stitches are then picked up around this edge, and the remainder of the shawl is knit in the round. Beads (which are optional, but you really should bead!) are placed as you knit. You will need around 1,200 seeds beads, in size 8/0 for a subtle touch of sparkle, or 6/0 for a more pronounced pop. 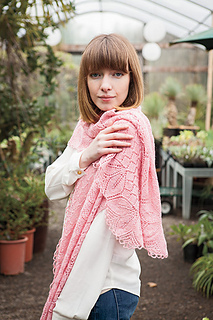 The sample shawl was knit with 6/0 beads. 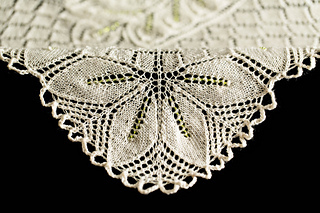 Unlike many lace projects, gauge is actually important for this design, as it is already quite large, and the unique construction method makes it difficult to resize. 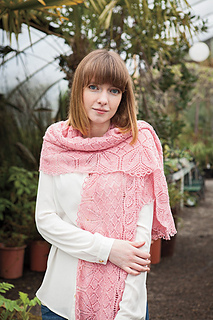 It is knit at a tighter than average gauge for lace, please take the time to check. Any changes in gauge will effect both finished size and yardage required. You will need a set of 5 double point needles as well as a long (at least 48”) circular needle. This can also be worked using 3 shorter (24” or so) circular needles. Please note that some companies and sites label the 2.5mm as US size 1. If you are having trouble finding US 1.5 needles, try looking for 2.5mm needles. You will need to know how to do a circular cast on (Emily Ocker, icord, etc), and how to place beads as you knit (with a crochet hook, Superfloss, etc). 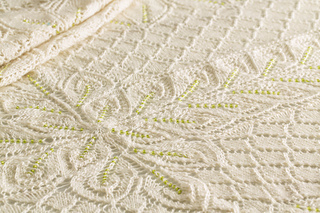 This pattern features large, easy to read charts, full line by line directions, and stitch count totals for every row, which are broken down into sections, so you don’t have to count every stitch. It also has a photo schematic illustrating the unique construction. This pattern is quite large (29 pages), but it has several features designed to help you navigate through it. Each section has cross reference links to help you jump between the overview, charts, and line by line directions. If you are knitting from a screen (computer, tablet, or smartphone) these are interactive, clickable links. The final 2 charts, which are quite large, are available both on a single page (for easy scrolling and zooming when viewed on a screen) and spread over two pages that you can cut and tape together. In addition this pattern has a fully functioning index, so you can choose which pages to print.